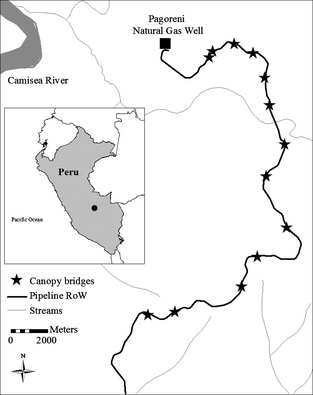 A study in the Urubamba region of the Peruvian Amazon documents how arboreal animals use canopy pathways left intact by humans to cross a natural gas pipeline in the forest. [map] Scientists worked with a pipeline construction company to identify places along the route of a new pipeline where canopy trees could be uncut allowing their large branches to bridge the cleared route naturally. Of 42 sites identified, only thirteen were feasible due to engineering restraints. 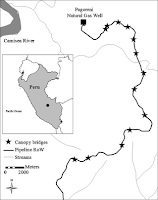 A two and a half mile stretch of pipeline without crossing points was used as a control, to assess the effect of canopy bridges on animal behavior. Remote cameras were strategically placed at the crossing points; images were captured of animals using the bridges and confronting the pipeline on the ground. The remote cameras are relatively noninvasive; some critics think the use of flash photography using visible light is unacceptable since it can temporarily blind species who have sensitive night vision. But the information collected by the cameras is invaluable since it would be logistically impossible to collect the same amount and quality of data without the use of the equipment. The data collected was abundant and revealing. In total 25 different species used the bridges, at a rate of 200 times that of ground crossings. [photo: tamandua & infant crossing] The researchers estimate that about 150 individuals used the pathways left for them. The absence of 19 arboreal species crossing on the ground indicate that pipeline routes do effect animal behavior and have the potential to further fragment forest habitats; thousands of square miles of the Amazon basin are zoned for resource development. In Peru, some resource companies are beginning to incorporate natural crossing points for wildlife in their planning. Hopefully the Peruvian government will require all development companies to do since it is shown to be a cost-effective and beneficial feature. Once again research shows that animals can adapt to man's presence if given an opportunity to do so.